My guess is that the HTML is being escaped over the XML-RPC channel. What are other ways to diagnose the issue? EDIT: You should use the DOMParser API as Wladimir suggests, I edited my previous answer since the function posted introduced a security vulnerability. The following snippet is the old answer's code with a small modification: using a textarea instead of a div reduces the XSS vulnerability, but still could have issues on IE9 and older Firefox versions. Basically I create a DOM element programmatically, assign the encoded HTML to its innerHTML and retrieve the nodeValue from the text node created on the innerHTML insertion. Since it just creates an element but never adds it, no site HTML is modified. It will work cross-browser (including older browsers) and accept all the HTML Character Entities. 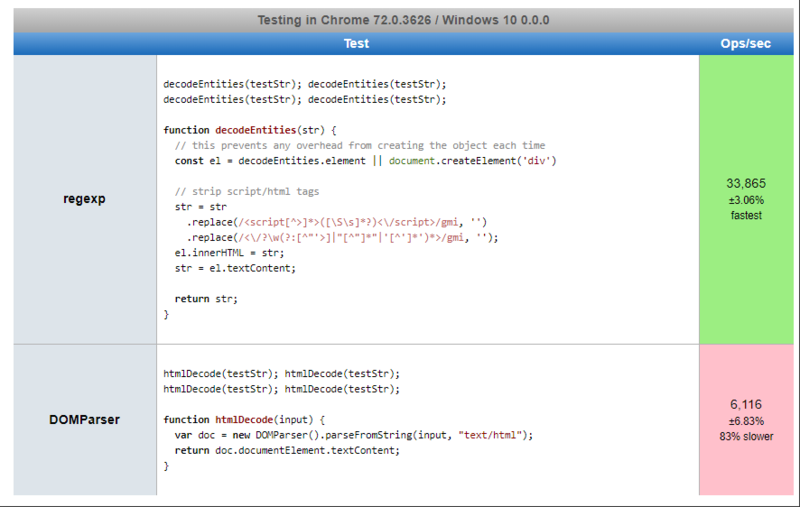 EDIT: The old version of this code did not work on IE with blank inputs, as evidenced here on jsFiddle (view in IE). The version above works with all inputs. UPDATE: appears this doesn't work with large string, and it also introduces a security vulnerability, see comments. // This returns "<img src='myimage.jpg'>"
Compatibility note: Parsing HTML with DOMParser requires at least Chrome 30, Firefox 12, Opera 17, Internet Explorer 10, Safari 7.1 or Microsoft Edge. So all browsers without support are way past their EOL and as of 2017 the only ones that can still be seen in the wild occasionally are older Internet Explorer and Safari versions (usually these still aren't numerous enough to bother). Otherwise, use Strictly Software's Encoder Object, which has an excellent htmlDecode() function. The trick is to use the power of the browser to decode the special HTML characters, but not allow the browser to execute the results as if it was actual html... This function uses a regex to identify and replace encoded HTML characters, one character at a time. // Chrome splits innerHTML into many child nodes, each one at most 65536. // Whereas FF creates just one single huge child node. Not a direct response to your question, but wouldn't it be better for your RPC to return some structure (be it XML or JSON or whatever) with those image data (urls in your example) inside that structure? All of the other answers here have problems. html= html.replace(/\r/g, String.fromCharCode(0xe000)); // Replace "\r" with reserved unicode character. htmlDecode('&lt;&amp;&nbsp;&gt;'); // returns "<& >" with non-breaking space. htmlDecode('  '); // returns "  "
htmlDecode('\r\n') // returns "\r\n", doesn't lose the \r like other solutions. There is an variant that 80% as productive as the answers at the very top. If you need to leave tags, then remove the two .replace(...) calls (you can leave the first one if you do not need scripts). What's the right way to decode a string that has special HTML entities in it?